Unitas Youth Zone will be a resource for all the young people of Barnet and surrounding boroughs to maximise the opportunities available to them. As such, we will always be open to partnership work with local agencies. Outreach team: A minibus and outreach team can be provided by the Youth Zone to support and engage young people from across Barnet, including supporting and enabling them to attend to the Youth Zone. Sharing and publicising information on transport: Utilising social media to share information on transport with young people by social media, by making bus timetables available in the Youth Zone, publicising that there will be a drop off point at the Youth Zone. Use of bicycles: We will offer cycling and safety awareness training to young people, staggered leaving/closing times to avoid mass exit, working with schools to access volunteer drivers and minibuses and traffic calming near the site. Working in partnership: Develop and support youth work in Barnet by mapping all provision including specialist services such as those delivering employability, exploring joint opportunities for funding, training and volunteer recruitment. Developing a culture of partnership: Make sure small groups are supported to access funding, joint planning for effective and complementary work and link with existing groups to access the Youth Zone and make use of its facilities. Develop information sharing and communication sharing systems to support this the creation of this culture. Volunteering, build the capacity of volunteering within Barnet through coordinated communication and recruitment. 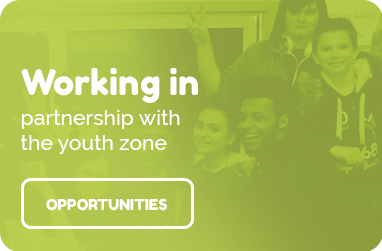 Support a joint working ethos in Barnet to develop and support youth work in the borough. Host an ‘aspiration themed’ event in the Youth Zone to support the development, progression and aspiration of Barnet’s young people.